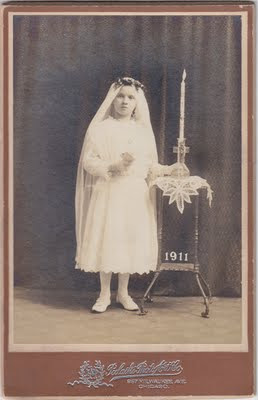 Visit ChicagoGenealogy.com to learn more about Chicago research. 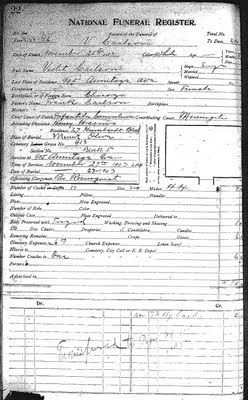 Recently a client asked for help locating death information for members of a Norwegian family and made me think of the John M. Pedersen & Sons Funeral Home records that are available on Family History Library microfilm. If you have Norwegian ancestors who died in Chicago between 1899 and 1972, you might want to check these out. 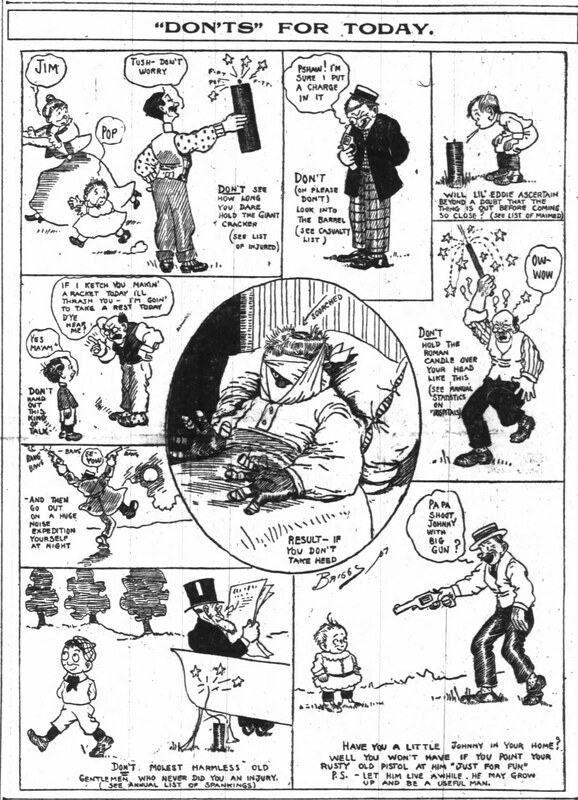 Last night I took a look at the first few items on film 1672191 which covers part of 1913 through part of 1926. The first thing I noticed was that the volumes were indexed and the index included addresses, something that might be helpful when researching a family with a common surname. The handwriting was clear and it was easy to jot down page numbers of interest. The volume I looked at was organized chronologically, one page, one person, and the page numbers were easy to read. 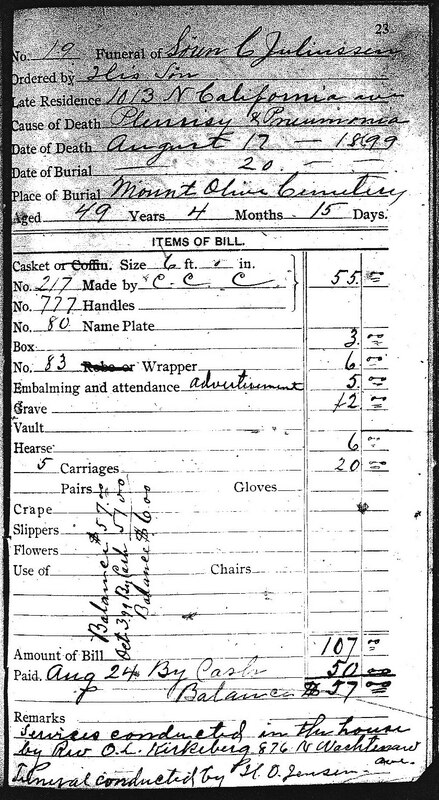 The entries included the usual information about the deceased--things like name, death date, parents, birth date, and address--but they also included specific burial information including information about the service (location, time, officiating clergyman) and the burial (casket size and maker, method of travel to the cemetery, and expenses). If an obituary was published, the name of the paper was given. To get a better feel for what these records are like, take a look at the iPhone photo examples below. So, why would you want to consult these records? 1) To learn if and where an obituary was published. 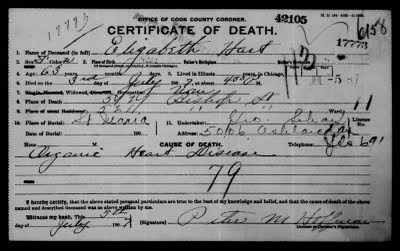 2) To obtain information about deaths after 1947 without ordering $15 death certificates. 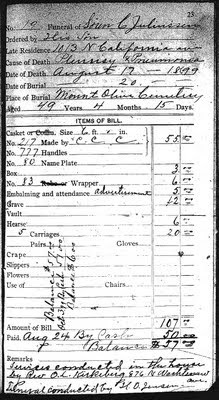 3) To gather details about a burial. 4) To search for a Norwegian death when you can't find the name in a death index. 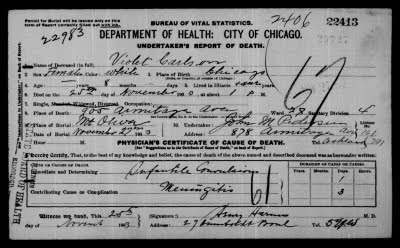 As I write this, I'm wondering if the funeral home records before 1910 would provide any information than the Chicago death certificates did during that time--spouse or parents, for example. I'll check the next time I'm at the Family History Center. 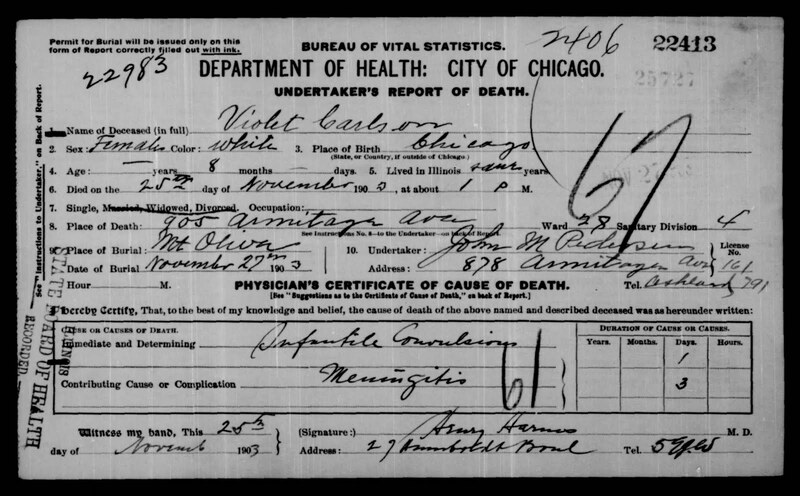 I checked the volumes beginning with 1899 and similar to the early death certificates, the register didn't provide a place for parent names. 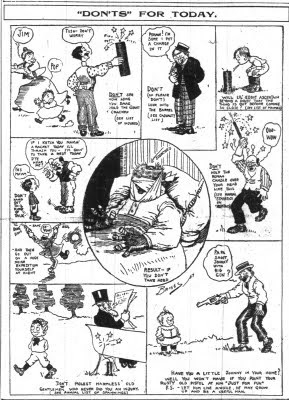 But, the register that begins with an August 1903 entry does include space to record that information. 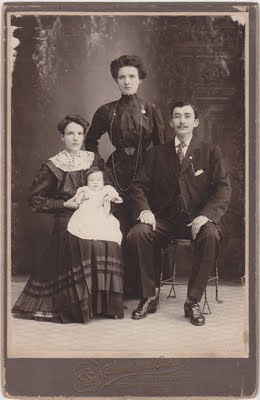 Most times parent names are left blank but a few are recorded. 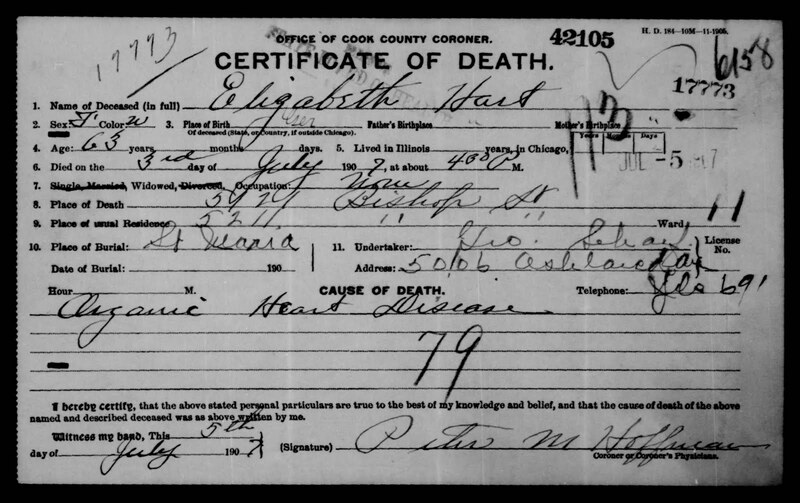 In the examples below, Violet Carlson's parents aren't listed on the death certificate but her father's name is given in the Pedersen register. 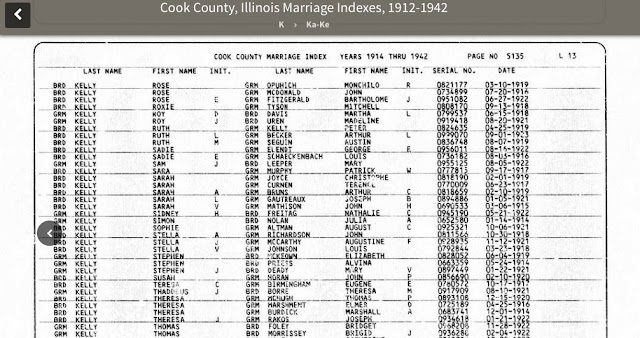 This would be a valuable piece of information for a researcher trying to piece together a family, especially one with a common surname. 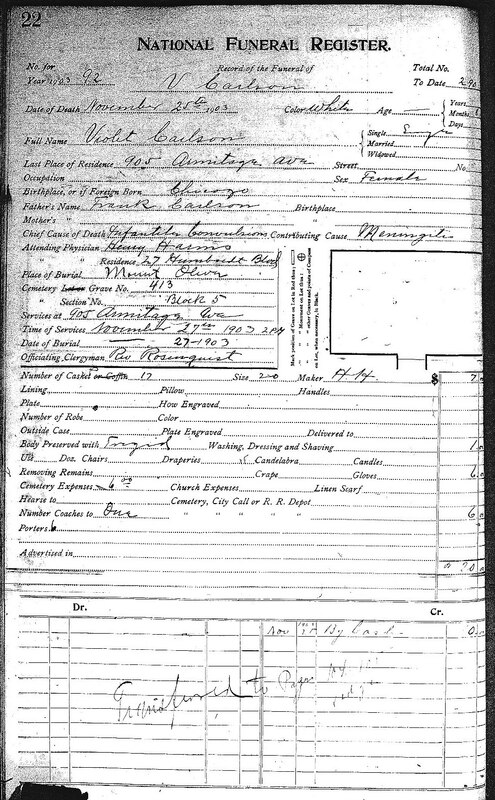 So, if you find a death certificate at FamilySearch for 1903 forward and if the undertaker is listed as "John M. Pedersen," it would be well worth checking these records. If you're in the Chicago area, there are two free genealogy workshops at the Wilmette Family History Center on Saturday, July 30, both led by Denise Mortorff, a retired university lecturer from California with 35+ years of family history research experience. Furthering your colonial ancestry requires resourcefulness. Move your search forward by learning the historical context in which you are searching, the knowledge and skills required to conduct research, record types, their availability and how to determine their ”fit” with your research needs. Thousands of organizations around the world house materials that can enable researchers in furthering their ancestry. Learn about organization types, how to identify those pertinent to your research needs, and ways to access their collections from a distance. Considerations in creating effective research queries will be presented. If you're interested in one or both, feel free to email me for more information. Last week my husband's banjo teacher told me that a friend of his had uploaded scans of historical photos--including pictures of early musicians--to a Facebook account and that I should really take a look. I did. One photo in particular caught my attention--a man and a woman standing side by side for the photographer. I don't know anything about the people in the photo but it was easy for me to imagine a story filtered through my own experience and imagination. The man's coat--not a suit jacket, a coat--was heavy and hung from his shoulders in a box-like shape. The bottom of it was noticeably wrinkled and his pants were baggy and worn, his shoes coarse. His large hands were drawn up across his chest in an awkward sort of way but they looked strong, like the hands of a laborer. 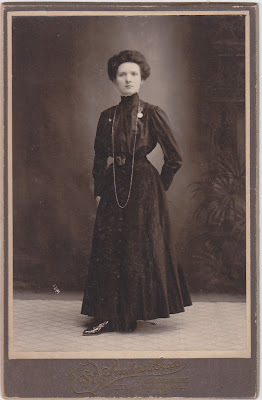 The woman cut a solid figure clothed in a dark dress with rows of light vertical dots and a wide ribbon at her collar. The fascinating thing was that the faces of the man and the woman seemed to match. 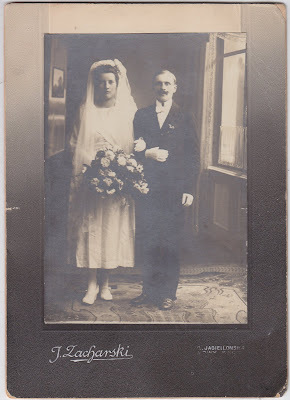 It's possible that they were brother and sister, but I don't think so. 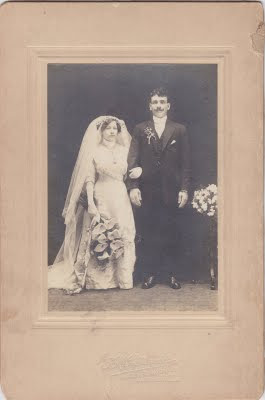 Some people say that people who have been married a long time begin to look alike. I think that might be true. Both the man and the woman were staring straight ahead, almost emotionless, but the woman had threaded her arm through the crook of the man's and it seemed that their bond was strong. Whatever life held for them, they were in it together. 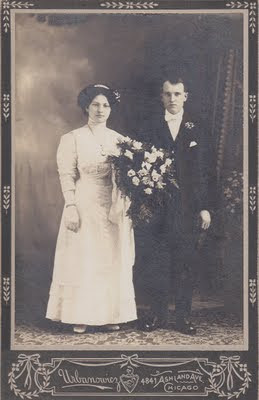 I suppose I'm a romantic at heart but I loved looking at that photo and I've thought about it ever since. 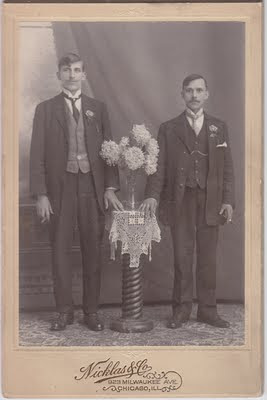 Browsing the album reminded me of a batch of old photos that I once bought on eBay. Some of them are from Chicago photographers and I think it's likely that they're all Chicago-related. Only one has any identifying information. The back of the first photo below reads "Frank Myslinski, 21.E. 120 Str, Kensington." After my experience looking at the Facebook album this week I thought I'd share the photos that I have. Peering into the pictures below, do you see a story? If you do, please share. Have a safe and happy Fourth of July everyone! I have a bachelor's degree in Japanese and a master's degree in reading instruction. I'm a co-founder of Genlighten.com and I provide customer support for the site. I also offered research services in Chicago for 10 years focused on helping people locate genealogical records for Chicago and Cook County research. 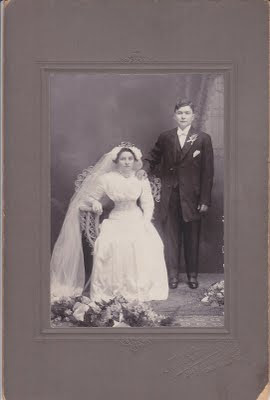 If I'm not doing something genealogy-related, I'm probably playing the banjo or fiddle. I discovered old-time music in 2008 and it's become a very happy part of my life.